Hess Tent Rental LLC was founded in 2008 by Mike Hess. Mike had worked for another tent rental company for several years prior to starting Hess Tent Rental. In 2008, he decided to start his own company that would offer tent and accessory rental items for all occasions, but with a focus on outdoor wedding receptions. Mike wanted to offer clients an opportunity to work with a company that was customer service oriented, flexible, and one that cared about the details of every event. 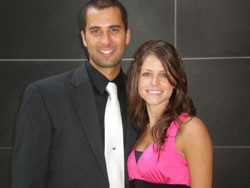 Mike is married to his wife Kristen who is a family medicine physician and is not actively involved with the business. They currently live in Manheim, PA and are active members at Chiques Church of the Brethren. Their faith in Jesus Christ is the most important thing in their lives and has been the cornerstone of Hess Tent Rental LLC.